Acrylic is probably my favourite material in the modding world. You can do so much with it - mould it, cut it, shape it, frost it, engrave it. It comes in almost every colour of the rainbow, it's affordable, and the tools to work with it are equally cheap. What does a strip heater cost nowadays – fifteen quid? Of course, for all of its benefits, acrylic comes with some drawbacks, many of which are design related. It's easy to make an acrylic box, slap some hardware into it, and call it a day - but that doesn't really create anything special. No, when you make a case out of acrylic, you're really making part of the case just disappear - which means you need to be all the more careful about what it's revealing underneath. And that's why Design_Master's project, LUMINA, has turned so many heads. By carefully blending smoke and clear acrylic, he's made a case that stands out in places, disappears in others, and provides a unique visual presence everywhere you look. As Luciano says himself, "I didn't want a fishbowl." And with that, I'll turn it over to the maker himself. First, let me introduce myself: My name is Luciano Cezimbra, and I am a 31-year-old Brazilian civil engineer. Since I was child, I have been linked to computers – by age 14, I was writing my first personal programmes. Some years later, I was developing automation software for companies and stores. My last software was a complex project to simulate and compare video cards performances called vgaindex. Despite all of my modest knowledge about software and hardware, there was still a computer element needed to be explored by me: the case design. I discovered the art of modding two years ago and I started to test many materials, including acrylic. Immediately, I was impressed with its strength, its incomparable luminous reaction and moulding capacity, allowing me to create pieces of nearly any size or shape. It was enough to convince me that acrylic was the best choice for my future projects. Obviously, to reach the desired technical level, I had to perfect the skill of cutting, paring, polishing and moulding. I learned these by visiting the factory installations of a friend of mine, who is my acrylic supplier. Through the observation of big machines, I learned that I could recreate the same effect (in reduced scale) by using inventive manual techniques. This is my way: To be able to reach a perfect execution level that looks nearly manufactured, but by using only the usual manual tools, specific methodology, simple procedures…and a bit of craftsmanship, of course. I always loved clean and bold projects, mainly the architectural building ones. This is my style, and LUMINA was not different. I sought to keep away from “aquarium look” that the most of Plexiglas projects follow, by inventing a new design and lighter structure. Undoubtedly, the engineering helped me to plan the project – to fix the alignment of some pieces and to find a solution for little building issues, such as adjusting the horizontal inclination angles of the two hinged doors to prevent them from being jammed. 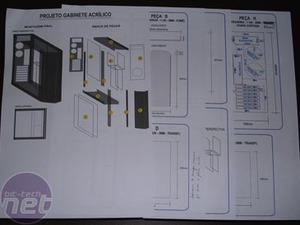 The first step for starting the project was to design and build all the case’s structural parts. All the other complimenting and accent parts would be made later. The end project combines 114 acrylic pieces – 14 structural ones and 100 complementing ones. The pieces are finished to be smoked, crystal or foggy. 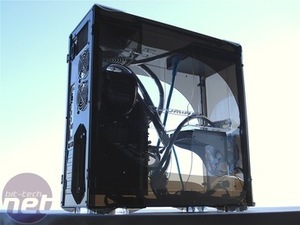 The final case reaches the following dimensions: 520mm height x 285mm width x 545mm length x 2-15mm thickness (this includes thumb screws and foot stands). It started as a plan, and ended up being an acrylic design masterpiece. For fabricating all 114 pieces of the LUMINA project, I performed the cuts, mouldings, finishes and polishes procedures manually by using a Dremel, sandpaper, drill, soldering irons and aluminium heat moulds. I only requested the factory to mould some of the 14 structural pieces because of the technical impossibilities of moulding parts this big at home.